A member of Sinn Fein has described how he was set upon as he videoed a loyalist ‘kick the Pope’ band deliberately circling and playing sectarian tunes outside a Catholic church during the Orange Order’s main Belfast ‘Twelfth’ parade. 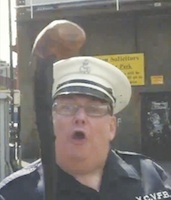 Belfast community worker JJ Magee later released the video [see below] which shows the band playing the so-called Famine Song, which contains notoriously anti-Catholic and anti-Irish lyrics. A second video clip, which has not been released, shows the band playing ‘the Sash’, another sectarian tune. The Shankill Road-based YCV Flute Band, which is dedicated to the memory of a UVF paramilitary, marched in ritualistic circles for up to 30 minutes in front of St Patrick’s Church on Donegall Street. A large crowd of loyalists cheered them on. Mr Magee said he had been part of a group of community workers monitoring the parade in the nationalist Carrick Hill area. The Orange Order’s parades celebrate a historic Protestant victory over Catholics on July 12th every year. Sectarian provocations are a routine element of such parades, but are typically ignored or censored by the mainstream media in the North. “I went over and began to record what was happening,” said Mr Magee. “At that stage I didn’t feel under threat and was just standing on the footpath recording. One man can be heard on the video threatening Mr Magee, while another holds a club in his direction. The New Lodge man described the episode as “frightening”. The Shankill Road-based YCV band had been making their way from nearby Clifton Street Orange Hall to the main Belfast Twelfth demonstration. The group was formed in 2007 for the “preservation and promotion” of the memory of Thomas Kinner -- a former member of the Young Citizen Volunteers, the youth wing of the UVF death squads, who died in 2003. The second clip, recorded by a local resident, shows two members of the PSNI police standing beside the church, apparently facilitating the provocation. Two nationalist residents are seen to remonstrate with the PSNI about the display, but are ignored. Sinn Fein councillor Conor Maskey said two prominent unionists, North Belfast DUP MP Nigel Dodds and Assembly Member Nelson McCausland had also been near the band at the time. “Nigel Dodds and Nelson McCausland were in close proximity yet did nothing to intervene,” he said. “It is time for the Orange Order to show leadership, step into the 21st century and get rid of the organisation’s anti-Catholic, sectarian ethos. The release of the video into the public domain led to an outcry on social media sites. In an extraordinary response, the flute band claimed they were harmlessly playing a tune by the Beach Boys. Nelson McCausland supported the band this week with an equally absurd statement. “The band could equally have been stopped outside a paper shop or a chip shop”, he said. “It simply was by coincidence that they were outside [the church]”. North Belfast Sinn Fein councillor Conor Maskey said Mr McCausland’s comments were “an utter disgrace”. “The DUP politician should hang his head in shame. Instead of attempting to gloss over and excuse such sickening and offensive behaviour he should be condemning it,” he said.